All we have to do is to write the sup-Birt and give specific reasons, details, and explanations. First Of an, my child can learn English better in the US than in Korea. At school, my child will learn various subjects like Math, Science, Social Studies, Music, and Art in English. Doing so, he/she can talk and write about various topics in English. Then after school, my child will converse with others in English. his way, he/ she will practice conversational English. Got it? You can write the other two supporting paragraphs the same way. Now, expand the second and the third paragraphs in your own words. 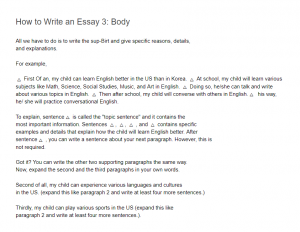 Thirdly, my child can play various sports in the US (expand this like paragraph 2 and write at least four more sentences. ).